Beautifully crafted contemporary metal curtain poles from the Galleria collection. 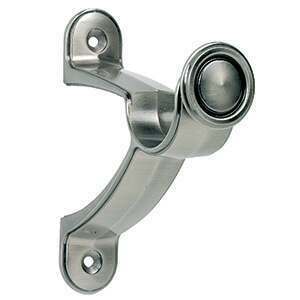 All curtain rings, brackets, finials, fixings and instructions are included. The beautifully crafted Galleria Caged Spear metal curtain poles are part of our premium quality collection which are manufactured from tough steel and depending on your chosen colour, are ideal for furnishing both modern and contemporary homes. 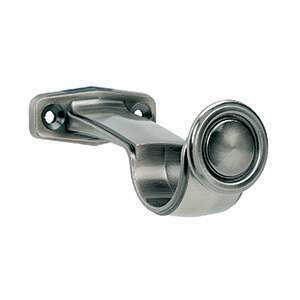 The Galleria curtain poles are supplied as complete kits including all necessary quantities of metal curtain rings with nylon lining in the inside edge which allows for a nice smooth and quiet curtain glide. Also included are the finials, fixing screws, wall plugs, fitting instructions and extra strong wall fixing stylish metal Galleria curtain pole brackets. The pole has a large diameter of 50mm (2") and is suitable for hanging heavy weight curtains of up to 25kg (55lbs). Available in multiple lengths starting from 120cm (47 1/4") and going up to 480cm (189") maximum length for furnishing extra large windows and patio doors. Lengths of 300cm (118 1/8”) and above are supplied in 2 halves with a centre bracket and hidden internal pole joiner included. Poles can all be easily trimmed down to your exact required length at home using a fine tooth saw. The finials are easy to remove first. Extra strong wall fixing brackets made from solid steel (shown in brushed silver) - select your required colour and pole length and see the 'Specification' tab for measurements. Images below - Left image: Supplied Galleria End Brackets. Right image: Galleria Centre Bracket, supplied with pole lengths of 300cm (118 1/8") and above. Complete with all necessary quantities of curtain rings, brackets, finials, fixings and fitting instructions. Suitable for heavy weight curtains of up to 25kg (55lbs). Lengths of 300cm (118 1/8”) and over are supplied in 2 halves with a hidden internal pole joiner and centre bracket. Available in extra long lengths of up to 480cm (189"). A thinner 35mm (1 3/8") diameter version of this curtain pole is available – see the ‘related items’. Extra curtain rings, brackets (alternative brackets include recess brackets) and coordinating holdbacks are available to purchase separately – see the ‘related items’.